SEBRING - A home-made little sports car, constructed in a Clearwater garage from a Miami junkyard parts, made an interesting if short-lived debut here yesterday in the 12-hour Race of endurance. The SAAB-powered Begra, owned by Clearwater architect Gene Beach and Miami car parts dealer Henry Grady, was forced out of the race after five hours by engine failure. The "do-it-yourself" fibreglass roadster drew special attention from the large crowd. It is designed for low budget weekend racing faddists, and when it is fully established, it will probably sell "for under $3,000," a Begra pit crewman said. The name, by the way, is a composite of the beginning of the owners' names. The firm is Begra Competition Cars. The Begra was built entirely in Beach's garage at 1021 Brook Drive in Clearwater with nearly 1,000 hours of furious work since Jan. 10. "Nearly every part in that car was used before," according to Bryan Webb, Grady's partner, "and many were lifted from Miami junkyards." The transmission came out of a wrecked Fiat bus and the wheels spun thousands of racing miles on other cars before being put on the Begra. Beach designed and built the fibreglass body embodying classic aerodynamic lines gleaned from his architectural know-how. Grady scrounged up the Fiat transmission and suspension and Saab supplied the tiny two-cycle engine. 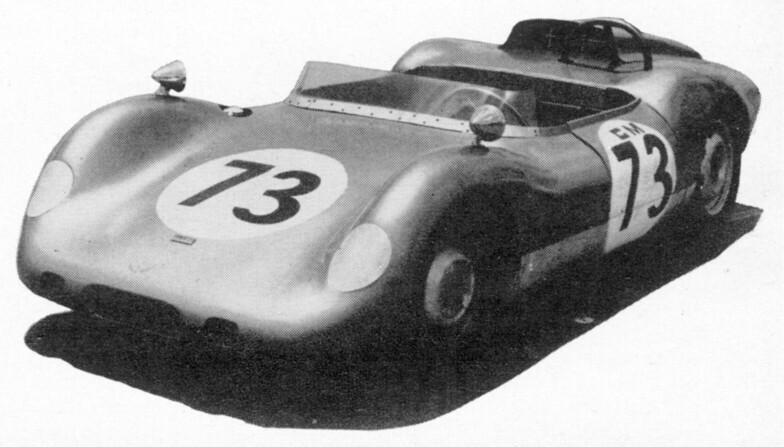 The car ran well up in class despite three off-course spins, one which battered the fibreglass body.